RECIPMT is also organising training programmes for the Executives of International Power Sector Organisations. 87 batches of training were organised to International Power Sector Executives of 86 countries. The duration of trainings varies from 4-12 weeks. RECIPMT is the nodal agency for coordination and implementation of the National Training Programmes for C&D Employees across the country, under Deen Dayal Upadhyay Gram Jyothi Yojana (DDUGJY) of Ministry of Power, GoI. Till 31st March 2018, RECIPMT organised training for 2, 32,930 C&D category of employees of various power utilities. RECIPMT has also organised training of 41016 power distribution franchisees during the 11th plan. RECIPMT has been conferred National Education Award 2016 by ABP News. The award has been given in recognition for its excellent contribution in providing training in power sector. The Award was received by Additional Director RECIPMT on 23.6.2016 at a glittering ceremony held at Hotel Taj Lands End Mumbai attended by representatives from academic and educational institutions. Conducted National Training Programs for C & D category employees of PDD Jammu & Kashmir JDVVNL & SOUTHCO. 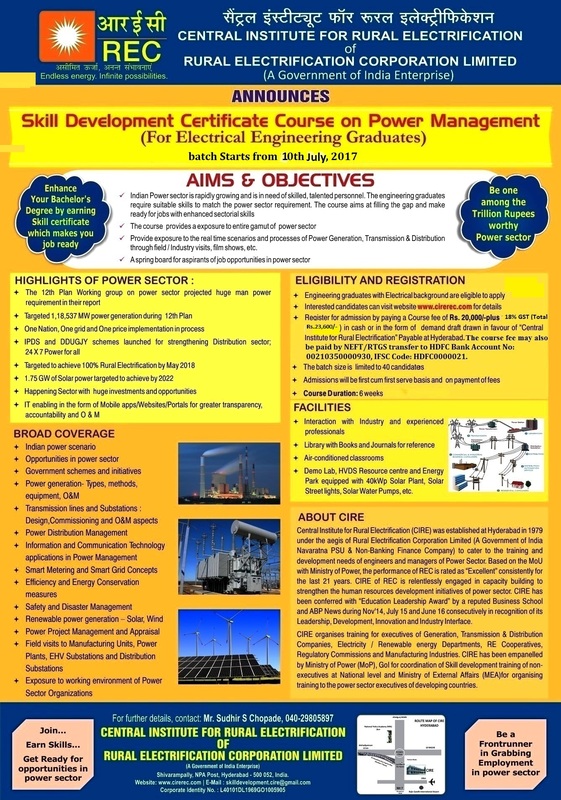 Invites Resumes for Empanelment as Faculty/ Consultants having experience in Power Sector. For details visit Empanelment option in this website.